My sewing instructor (Becca of Create! 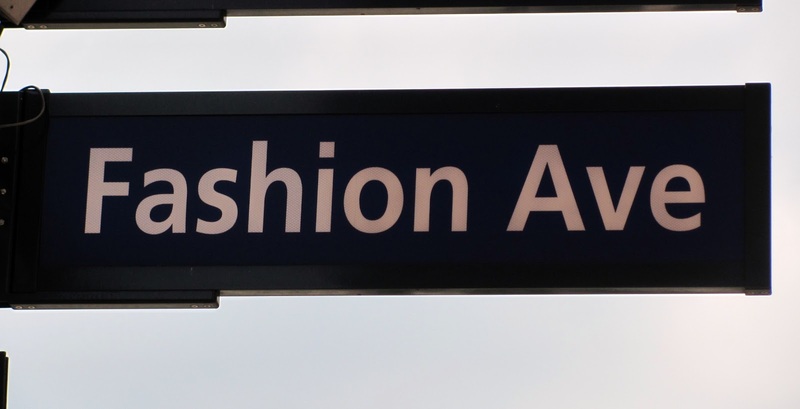 Sewing Studio via Sarah Veblen) was kind enough to put together a great list of her favorite fabric stores before my trip last week to NYC for Fashion Week. I knew I might have a little time to kill (which ended up not being as much as I would have liked) so I definitely wanted to hit up some of the great fabric stores in New York's Garment District. I will share her list with you, because, I am crediting her genius and research after all. I only made it to 3 fabric stores (Mood Fabrics, B&J and Stretch House) before I had to call it quits due to time constraints and the need to majorly take a shower before a dinner I was attending... but I must say that what I did see? It was heavenly... and I cannot wait to get back to the city to hit up some more. Spandex House (www.spandexhouse.com) - 263 W. 38th Street, New York, NY 10018 (212-354-6711). If you're looking for a knit with spandex, they have it. From stretch tulle to jersey to stretch lace. Best slinky knit selection and price I've found. Excellent mail order service, and inexpensive prices. Spandex World (www.spandexworld.com) - 228 W. 38th Street, New York, NY 10018 (212-391-2310). Smaller than Spandex House, but with an excellent selection. Prices, like Spandex House, are excellent. Stretch World (www.stretchworld.com) -- 252 W. 38th Street, New York, NY 10018 (212-398-3004). Like Spandex World, smaller than Spandex House, but with a very nice selection. Prices are excellent, and they are happy to send swatches. Mood, Inc. - 225 W. 37th Street, 3rd Floor, New York, NY 10018 (212-730-5003). Also in Los Angeles (www.moodfabrics.com). Excellent selection of silks, plus fabrics of all kinds. Wonderful selection of tissue wools, wool gauze, and novelty wools; and a fabulous selection of interesting cottons. If you write the store for swatches, service is not always speedy; but I've been told that ordering fabric or swatches from their website works smoothly. B & J Fabrics - 525 Seventh Avenue, New York, NY 10018 (212-354-8150) (www.bandjfabrics.com). They will send free swatches and have excellent mail order service. Fabrics of all kinds; especially good for silks; good selection of tissue wools and wool gauze. Bazar Fabrics, Inc. - 256 W. 39th Street, New York, NY 10018 (212-575-5640). A lovely store for all sorts of ornamented fabrics, including lots of hand-painted, embroidered, and beaded sheer fabrics. Elegant Fabrics - 240 W. 40th Street, New York, NY 10018 (212-302-4984). A wide variety of fabrics all of excellent quality. Mail order service is extremely good, and they'll send free swatches. Exclusive Lace Star - 215 W. 40th Street, New York, NY 10018 (212-391-7777) (www.lacestar.com). If you are in NYC, go here just to look - the most exquisite laces, most of which are designed by the owner Rachel Hezghia. Beautiful imported tulles, and the nicest selection of printed silk chiffons I've ever seen (not the typical "old lady" prints). They are happy to mail order. Gray Lines Linen - 260 W. 39th Street, New York, NY 10018 (212-391-4130) (www.graylinelinen.com). All linen fabrics with excellent prices. The linens in your swatch set came from here. I've never mail ordered from them, but they have told me they are more than happy to mail order. Metro Textile Corp. - 265 W. 37th Street, Suite 908, New York, NY 10018; (2120209-0004). A small store, but everything is quite interesting. The owner, Kashi, is very helpful, often willing to bargain, and happy to mail order. Let him know what you're looking for and he'll let you know if he has it. Paron's Fabrics/The Annex - 206 W. 40th Street, New York, NY 10018 (212-768-3266) (www.manhattanfabrics.com). A lovely selection of fabrics, a large number of them designer imported fabrics. Many of the swatches in your kit came from here. Good mail order service. M & J Trimming Company - 1008 6th Avenue, New York, NY 10018; (212-391-9072). (www.mjtrim.com). Daytona Braids & Trimmings - 251 W. 39th Street, New York, NY 10018; (212-354-1713). Ginsco Trims (retail division of Ginsburg Co.) - 242 W. 38th Street, New York, NY 10018; (212-244-4539). (http://www.ginstrim.com). Pacific Trimming Inc. - 218 W. 38th Street, New York, NY 10018; (212-279-9310). (http://pacifictrimming.com/). So wondering if I bought anything? Wellp, I did. I think that I very much exercised extreme control over my spending (well because I spent a lot at H&M before I went to these fabric stores) but I did see a couple fabrics at Mood that I just had to take home with me. There was a cotton stretch knit in bright colors (and I was inspired by that morning's Nanette Lepore show with TONS of bright colors) and another knit that I felt would make an awesome skirt over a brighter color fabric, sort of a play on the recent popularity of crochet and macrame, you know? i really envy people who can sew well. or sew at all. so much eye candy! Looks like a fabulous trip. I miss seeing that big button haha. While in college I worked as the swatch girl at my uncles textile business. 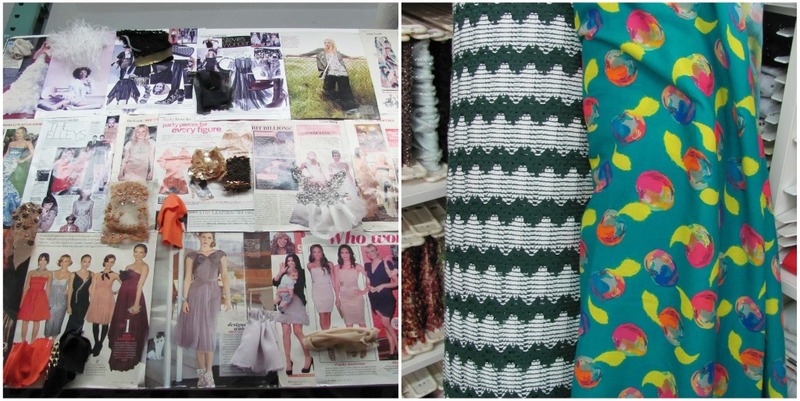 Can't wait to see what you create with your fabrics! Yay Mood!! !